We all have had times where we reflect back and think about the things we didn't accomplish, or didn't do or say............ and feel regret for not pursuing that "thing" that may or may not have made our life different. Or what about those words you never spoke and now you can't because that person is gone. What about the higher level position you didn't take at work because of fear. The girl that you let get away because you weren't "ready". You may have always said "next year" when thinking about completing that degree. 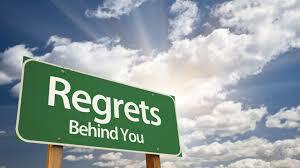 So what are your regrets? I recently saw a video on social media that was so powerful. It made me stop and think about the things I personally regret. (See video below).In the video, a chalkboard was placed on a street in New York City and it asked people passing by to write down their biggest regret. The comments were interesting. I immediately began to think about not only the things I regret but the biggest things that had a major impact on the course of my life. There are so many things and choices that I look back on and think......WOW, What if............ But one thing that I do regret was not continuing in my program to receive my specialist degree. But guess what..... its not too late. So now I must make the decision to either go for it or be ok with my decision to not complete my specialist and move on to other goals. There are other decisions that cant be changed. For example: Staying in an unhealthy relationship for too long. You can't go back and change that. But what you can do is move on, be ok with it and make better decisions next time around. I'm sure you can think of numerous things that can be put on your list and once you realize exactly what they are, then what? When you realize your regrets, it should bring you to the point where you decide whether or not you will change that regret to reality or let it go and move on. Its always possible. Isn't it? The chances you didn't take, the dreams that were not pursued, and words not spoken............. If its still possible when you come to that realization ....what are you going to do about it? 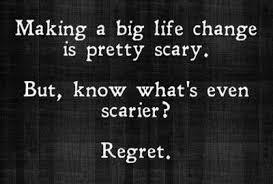 Continue to dwell in regret or try to change it to the point where at least you feel better about it. 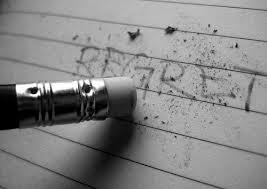 Going through life with a list of regrets can cause you to feel a certain way about your overall self. Its not healthy to continue to live with a bunch of "what ifs" ....So lets make it a point to change those regrets to reality and if nothing else start yourself off with a clean slate!! !